Twice a year, implementing agencies of the International Climate Initiative (IKI) in Thailand met to strengthen cooperation to tackling climate change. Among the IKI implementing organisations taking part were GIZ, Plan International, The Center for People and Forests (RECOFTC), United Nations Development Programme (UNDP) and World Wildlife Fund (WWF). Cooperation between projects funded by the German Federal Ministry for the Environment, Nature Conservation and Nuclear Safety (BMU) through the International Climate Initiative (IKI) makes a crucial contribution to experience sharing and mutual learning in addressing the climate change challenges of the partner country. 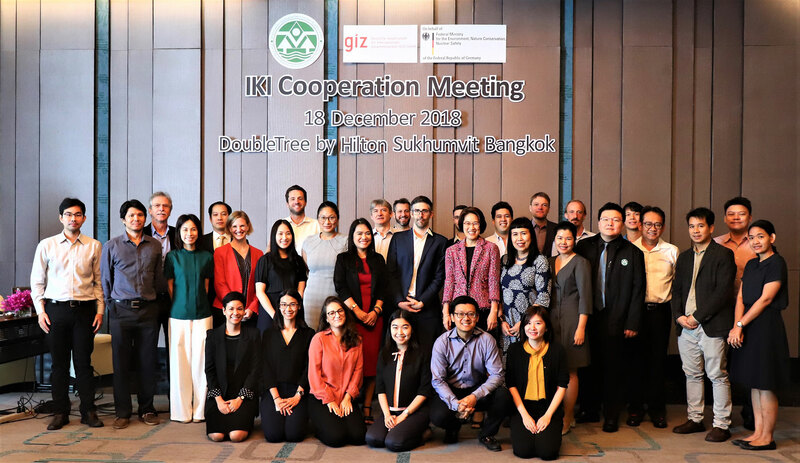 Therefore, Thailand’s Office of Natural Resources and Environmental Policy and Planning (ONEP) and GIZ organised a meeting, known as “IKI Cooperation Meeting”, bringing together all implementing agencies under the IKI initiative. In December 2018, representatives from the Thai government and international organisations met to discuss the status of their project implementation. On this occasion, challenges and opportunities for further climate-related work, climate change targets, and priorities of the Thai government were the highlights of the discussion. Representatives from ONEP presented policy progress on climate change, notably the National Adaptation Plan (NAP) which has been approved by the National Climate Change Committee (NCCC) in November 2018. This is seen as an important step towards ensuring an appropriate response to climate-related threats in Thailand. ONEP also announced 2 upcoming policy packages: Climate Change Act, a mechanism devised to help achieve Thai Nationally Determined Contribution (NDC) targets by delivering appropriate resources and by supporting relevant stakeholders, and the NDC Sectoral Action Plans. The IKI implementing organisations updated the status quo of their project implementation, potential synergies at the national and sub-national levels, and ways to promote closer cooperation among themselves and with Thai partners. To name a few, in the past years, Plan International has been engaged on the topic of climate change impacts on young women of the indigenous communities in the Northern Part of Thailand as well as awareness-raising of climate change issue at the subnational level. RECOFTC has a regional project that focuses on forest landscape reforestation which brings together private sector and local communities. Currently, UNDP is working on various climate-related topics: assessment of climate-friendly investment in renewable energy, NAP in the agriculture sector, GCF readiness, among others. At present, WWF has a project on sustainable consumer production focusing on agriculture and forestry, notably on maize production which leads to deforestation. Other issues that emerged include gender mainstreaming and visibility on climate-related work. For the latter, an enhanced communication strategy is seen by both ONEP and the implementing agencies as a pressing topic. The IKI is a key element of Germany’s climate financing mechanism and the funding commitments made under the United Nations Framework Convention on Climate Change (UNFCCC) and the Convention on Biological Diversity (CBD). Climate change mitigation, adaption to the impacts of climate change and the protection of biological diversity are focus areas. Since 2009, the IKI has provided support of at least 13 bilateral projects in Thailand, for a total volume of 50 million EUR (about 1.9 billion THB), as well as the involvement of Thailand in 13 regional and 27 global projects. Since 2009, GIZ Thailand has brought in experience to accelerate the implementation of national climate targets in both adaptation and mitigation. On behalf of the German Federal Ministry for the Environment, Nature Conservation and Nuclear Safety (BMU), through the International Climate Initiative (IKI), the team of national and international experts have enabled bilateral, regional, and global projects and programmes supporting Thailand’s transition towards a low-carbon and climate-resilient future.